Musicians: Lani Hall (vocals; and background vocals on 7, 8 & 10), Neil Larsen (keyboards and background vocals), Buzz Feiten (guitar and background vocals), Chuck Domanico (bass), Peter Donald (drums), “Manolo” Badrena (percussion), Jerry Knight (bass on 1,2,6 & 10), Larry Tolbert (drums and percussion on 1,2,6, & 10), Paulinho da Costa (percussion on 4 & 7), Michel Colombier (electric piano & synthesizer on 8), Michael Boddicker (synthesizer programmer), Airto Moreira (chanting and percussion on 3), Ernie Watts (saxophone solo on 7), Tim May (guitar on 4 & 8), Bill Champlin, Carmen Twillie and Venetta Gould (background vocals on 4,5, and 7), Bill Quateman (background vocals on 2), David Lasley and Arnold McCuller (background vocals on 1 & 6), Jerry Hey, Ernie Watts, Larry Williams, Gary Grant and Bill Reichenbach (horn section). With three years passing between Lani’s last album and this one, the landscape of pop music had changed a great deal. The softer sounds of folk-rock and country-rock had all but disappeared in favor of the driving beat of disco, which was everywhere. And seemingly, everyone back then attempted a disco record. While most of this album is NOT disco, surely one song definitely is: the title track, “Double Or Nothing,” composed by Allee Willis. 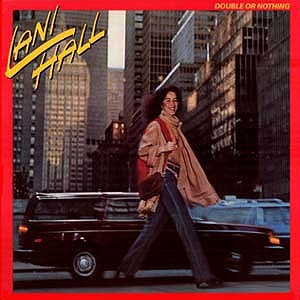 As was common practice at the time, a 12” disco single version of “Double Or Nothing” was released (A&M SP12019) to accompany this album and to promote the song as a single.